The price of some public transport tickets in Krakow went up today. 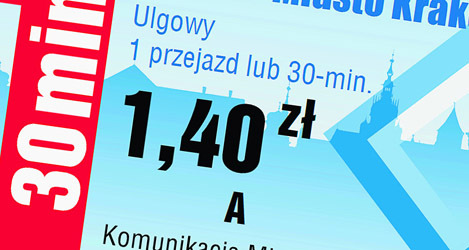 In the second round of price rises in a year the cost of a 30-minute ticket has risen to 3.20zł (from 2.80zł) and a 60-minute ticket to 4.00zł (from 3.60zł). A single-trip ticket now costs 3.20zł (up from 2.80zł). The cost of 15-minute, 90-minute, 24-hour and 48-hour tickets remain unchanged, but 7-day tickets now cost 40zł (up from 38zł). MPK has also introduced a new, round-trip ticket for 6zł that allows one person to make two separate journeys on the same day (it must to be validated on each leg). Check your wallet, because tickets with the old face values are no longer valid. Using them could result in a fine. Single-trip tickets cost just 2.50zł before the last increase in August 2011 – the new price is a 28 percent hike in eight months. MPK, the city’s public transport authority, is expecting to earn an extra 10 million złoty per annum from the new fares. Details of all Krakow bus and tram tickets are available in English on MPK’s website.